Parrots make colourful, interesting and very enjoyable pets and are relatively easy to feed and maintain. 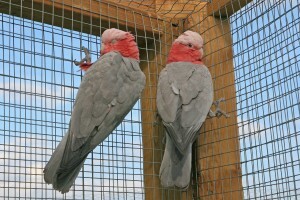 The Parrot Society UK recommends that you obtain captive-bred birds wherever possible. You must, however, remember that the larger parrots live a long time and keeping them is therefore a long-term commitment. Always remember to ask the seller how acclimatised your newly-acquired bird is, especially if you are going to put it in an outside aviary during the colder months. If you already have parrots it is always advisable to quarantine any new purchase for 35 days before allowing it into the proximity of your existing birds in case it is carrying any disease. If your new bird shows any sign of illness such as fluffed-up feathers, resting with head in the wing or on both legs instead of one, thin breast bone, loose droppings, heavy breathing or any discharge from the nostrils, keep the bird warm at 80º to 90º F or 27º to 32º C in a quiet location, ensure that the food (preferably easily digested food such as baby food is in easy reach of the perch) and contact a veterinarian with avian expertise immediately. Veterinarians with this expertise are not common and it would be sensible to locate one even before you buy a bird, as it is often in the very early days of ownership that you may require their services. The Parrot Society can assist you in locating one most local to you. Parrots relish a varied diet; in the wild they eat different fruits and seeds as they ripen month by month. If you were offered the same few foods every day you would quickly become bored and soon after start to suffer dietary problems. Make an effort to give your bird a wide variety of foods. The foods that should be offered on a regular basis are canary seed, mixed millets, hemp, wheat, maize, safflower, sunflower (in moderation as it is an oil seed and can cause obesity), oats, buckwheat, paddy rice, niger, linseed and groats. The most commonly used fruits for parrots include oranges, sweet apples, grapes, pears, cherries and bananas. If possible also include occasionally exotic fruits such as papaya, mango and kiwi. (On no account allow your bird to have avocado as this is poisonous to parrots.) Vegetables that should be offered include carrots, celery, spinach, beetroot, peas, beans and lightly cooked corn on the cob. Sprouted seeds and soaked biscuit are also popular. Do not feed your parrot with scraps from the table, although toast fingers lightly coated with honey and dipped in tea can provide an occasional treat. Larger parrots, especially macaws, should be given nuts in their diet throughout the year. These will include walnuts, brazils, pecans, macadamia, cashews, hazelnuts. Cob-nuts in season are usually enjoyed. If you can obtain palm-nuts from a specialist supplier, these can also be given in small quantities. It is important to ensure that all fruit and vegetables are washed thoroughly before use and all dishes used for feeding are always clean. Avoid placing any dishes directly under perches as they will quickly become soiled. Proprietary foods in pellet form are available, but many experienced aviculturists believe they do not provide foraging experience and have little therapeutic value. However they are very convenient and provide adequate nutrition, therefore may be used extensively or in part. For parrots kept in the home a large parrot cage is acceptable as long as the bird is allowed some liberty each day. Do not leave them unsupervised as they could chew electric cable or otherwise damage furniture and fittings. Large macaws, however should be kept in large outdoor aviaries or extensive indoor flight cages. All cages and aviaries should be fitted with natural perches (fruit tree or sycamore, willow, hazel, chestnut and eucalyptus branches are ideal) as these provide different diameters for the feet to move to, thus flexing the bones in the foot. It is important to change perches regularly. 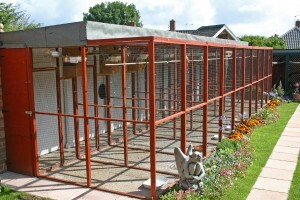 The floor of the cage should be covered with peat, shavings, sand or newspaper and changed daily. 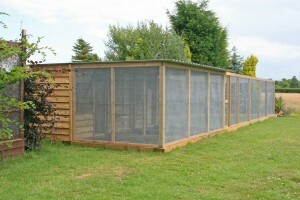 Aviaries in the garden should have a weather-proof draught-free indoor section to protect birds from extremes of weather. Try to provide your parrot with an interesting, stimulating environment as they are very intelligent and inquisitive creatures. They should have plenty of climbing opportunity, which could include cotton rope as well as wooden climbing frames. Suitable toys can be bought from your local pet store. Parrots kept in outside aviaries should also have plenty of perches and also cotton climbing ropes as long as these do not prevent them flying.